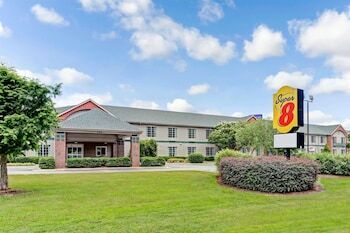 Located in Smithfield, Super 8 by Wyndham Smithfield is in a shopping district, a 1-minute drive from Carolina Premium Outlets and 5 minutes from Ava Gardner Museum. Featured amenities include a business center, complimentary newspapers in the lobby, and a 24-hour front desk. Free self parking is available onsite. Located in Kenly, Deluxe Inn is within a 15-minute drive of Hinnant Family Vineyards and Rudy Theater. Free self parking is available onsite. Located in Smithfield, Village Motor Lodge is a 3-minute drive from Carolina Premium Outlets and 5 minutes from Ava Gardner Museum. Free self parking is available onsite.